When WW2 broke out my father joined the U.S.Army and was inucted into the 1st Filipino Infantry Regiment. From what my mother told me he went back with General McArthur's in the campaign to liberate the Philippines. My father was wounded in the battle of Leyte and was sent to infermary and that's where he met my mom. The rest is history. Following the Japanese attacks that destroyed U.S. airfields on Luzon on 8 December 1941, thousands of Filipinos fought side by side with U.S. Army soldiers in the defense of the Philippines. Yet at the same time stateside recruiters refused to enlist Filipino volunteers due to their status as Americannationals.Under the Selective Service and Training Act, Americannationals were ineligible to serve in the Armed Forces of the United States. To fight a world war, however, the nation needed to call upon all its available manpower. On 21 December 1941 Congress amended the Selective Service and Training Act to permit enlistment of citizens and “every other male person residing in the United States.” As a result, on 19 February 1942, Secretary of War Henry L. Stimson announced the creation of a Filipino battalion to enable Americans of Filipino ancestry as well as resident Filipinos to serve together in the U.S. Army. On 1 April 1942, the War Department activated the 1st Filipino Battalion. Its existence proved short-lived. In July 1942, the soldiers transferred to the newly constituted 1st Filipino Infantry Regiment which replaced the battalion, and the new regiment was activated on 13 July 1942 at Salinas, California. On 14 October 1942 the Army constituted a second regiment, designated as the 2nd Filipino Infantry Regiment. The 1st Battalion, 2nd Filipino Regiment, activated on 22 October 1942 at Fort Ord, California. On 27 March 1944, the 2nd Filipino Infantry Regiment was disbanded, and the 1st Battalion was concurrently reorganized and redesignated as the 2nd Filipino Battalion (Separate). From Fort Ord, elements of the 1st Filipino Infantry Regiment and the 2nd Filipino Battalion (Separate) moved to various training locations in California before embarking separately at the Port of Embarkation in San Francisco for a 2 week voyage to the South Pacific. Soldiers of the 1st and 2nd Infantry Regiments participated in bloody combat and mop-up operations in New Guinea, Leyte, Samar, Luzon and the southern Philippines. Elements of the 1st Regiment arrived in New Guinea in April 1944 where they fought until moving to the Philippines in February 1945. There, some of the regiment’s companies provided security for Eighth Army General Headquarters, Far East Air Force, and Seventh Fleet Headquarters as well as a 2 airstrips, Tanauan and Tacloban. For the remainder of the war, the 1st Regiment manned checkpoints, participated in mopping-up operations, and performed security and support operations in the Philippines. The unit returned to the United States in March 1946 and inactivated at Camp Stoneman, California on 10 April 1946. 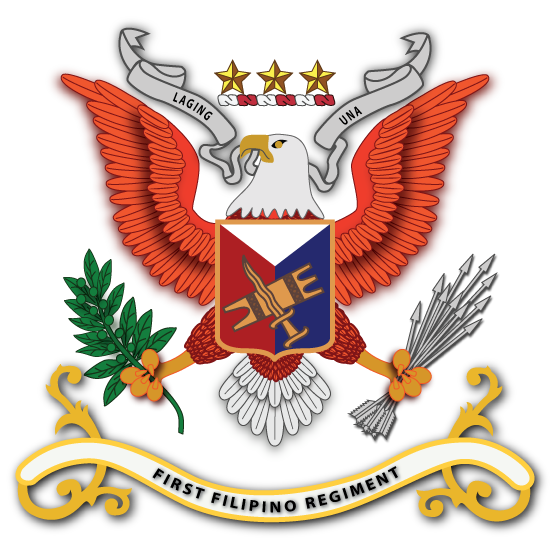 The 1st Filipino Regiment earned battle honors for New Guinea, Leyte, and the Southern Philippines. The unit additionally earned the Philippine Presidential Unit Citation. The 2nd Filipino Battalion (Separate) left the United States in June 1944 and arrived in New Guinea in July 1944. The battalion eventually moved to Manila, Philippine Islands, where it was inactivated on 21 December 1945. The unit earned battle honors for New Guinea. It did not receive any decorations.